NEW YORK, March. 2, 2017 /PRNewswire/ — Extell Development Company today announced it has sold over 100 residences, including a $13 million penthouse, at One Manhattan Square since the launch of sales in early November. 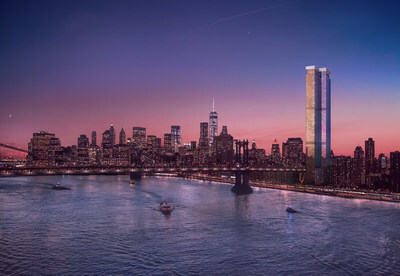 Extell’s largest luxury condominium project to date, One Manhattan Square is a modern glass tower along the New York Harbor on the Lower East Side. With limitless views, attainable prices and countless indoor and outdoor amenities totaling over 100,000 square feet, One Manhattan Square is a true vertical village with every conceivable luxury in Manhattan. Among the 100 residences sold is a 3,699-square-foot, $13 million duplex penthouse featuring 5 bedrooms and 4 and a half bathrooms. The extravagant home boasts an additional 416 square feet of exterior terrace space offering a bird’s eye view of the East River, Brooklyn, New York Harbor, Financial District and Midtown Manhattan. Unobstructed views can also be enjoyed from the home’s grand salon and corner master bedroom suite, complete with a dressing room. The penthouse features a windowed master bathroom with steam shower and heated floors, and windowed gourmet kitchen. World-renowned architectural firm Adamson Associates Architects designed the striking glass building with interiors by Meyer Davis Studio, the design firm behind Oscar de la Renta’s worldwide boutiques. Perfectly positioned to take advantage of panoramic skyline views, all of the 815 residences were intelligently planned and feature premium custom finishes. With a variety of one to three bedroom residences available, ownership in One Manhattan Square starts at $1.16 million with low carrying costs and an anticipated 20-year tax abatement. Residents at One Manhattan Square will never have to leave home with the unprecedented amenity package. Spread across four floors, the amenities were designed to provide the ultimate recreational, social and fitness experiences. Interior amenities include a spa centered on a tranquil courtyard and relaxation garden with private treatment rooms and hamam. The multi-level fitness center will offer multiple swimming pools, a bowling alley, a full-size basketball court, golf stimulators, squash court and yoga studio. Additional amenities include a state-of-the-art cinema and performance center, children’s playroom and teen arcade. Sophisticated amenities, such as a culinary lounge, wine room, cigar room, cellar bar and demonstration kitchen, provide an abundance of entertainment options. West 8, the illustrious Rotterdam-based landscape architectural firm celebrated for the Hills at Governors Island and Miami’s Soundscape Gardens, has created an outdoor oasis of over 45,000 square feet of landscaped areas. Lush gardens and outdoor amenities at One Manhattan Square provide meaningful spaces for socializing including fire pits, an adult tree house, a tea pavilion, stargazing observation deck, social courtyards and a covered dog run. Nowhere is New York’s multicultural history more legible than in the Lower East Side. Glamour and grandeur sidle up to graffiti and grit in this proud home to avant-garde galleries, boutiques and trail-blazing bars. One Manhattan Square will be steps away from the buzzing energy of this transforming neighborhood with some of the New York’s finest dining, nightlife and entertainment options. South Street Seaport and the bustling East River Esplanade are a stone’s throw from One Manhattan Square. Residents will also be near the City’s top schools including Parsons, New York University and Cooper Union. Extell Marketing Group is the exclusive sales and marketing firm for One Manhattan Square. Visit www.OneManhattanSquare.com for more information or call 212-252-1560 to schedule an appointment at the innovative sales and design gallery located at 220 South Street.